Township of Chatsworth (Lower Tier Grey)Record Owner? Log in. Pop. 479. In Holland T., Grey C., on Hwys 6 & 10, 13 km S of Owen Sound. The first settler, in 1842, was a Mr. Coyer, who built a log tavern at the site ofthe present community on the Garafraxa Colonization Rd. The place was first called Johntown for early landowner John Deavitt, and later Holland for the township. When the post office opened in 1851, it was named Holland East. In 1857 the name was changed at the suggestion of postmaster Henry Cardwell to Chatsworth, after Chatsworth House between Bakewell and ChesterfIeld in North Derbyshire, England, seat of the Duke of Devonshire. Writer, temperance leader, and women's activist Nellie Letitia McClung was born here in 1873. Her family moved to Manitoba when she was still a child and she remained in Western Canada until her death in 1951. 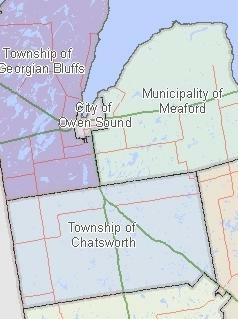 Have something to say about Township of Chatsworth (Lower Tier Grey)?